Should you believe in the horror stories – or in yourself? Sitting at our base camp, Ying from Singapore is doing her best to put the fear of God into me. 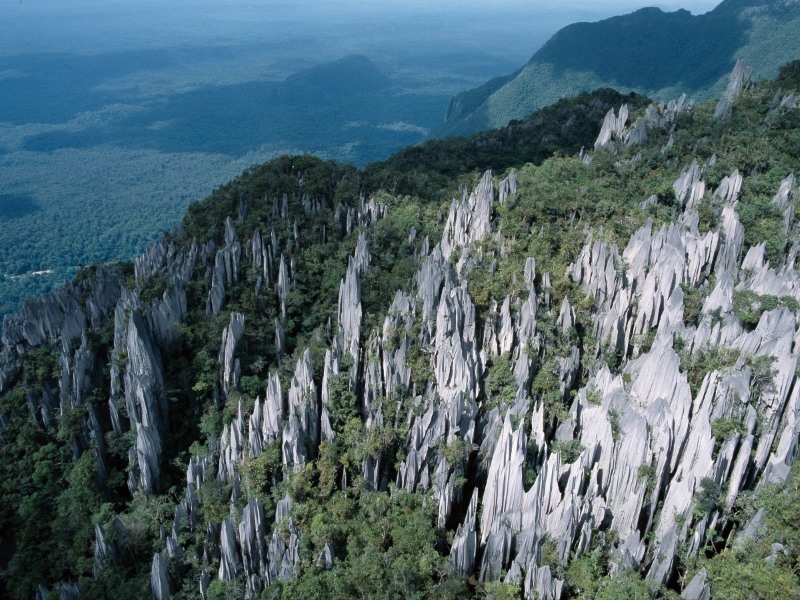 At the crack of dawn, about 20 of us will head off to tackle the infamous Pinnacles, a series of craggy limestone pillars rising up like sharks’ teeth from Gunung Mulu National Park in the rain-forested depths of Sarawak, northern Borneo. Thanks to Ying’s feeding frenzy on YouTube videos, I’m close to throwing in the towel. Getting here has already been an adventure. First, a scenic trip in a propeller-driven light aircraft takes me about 100mi (160km) inland from Sarawak’s South China Sea Coast to Park HQ in the lowland forests of this UNESCO-listed area. From here we hop on a longboat and head up the Sungai Melinau river, navigated by masterful Berawan boat people – one of northern Sarawak’s kaleidoscopic “Orang Ulu” (upriver) tribes. I’m guided by Noah, a lithe, jungle-savvy Berawan who was involved in the 1970s exploration which led to the creation of the national park and discovery of some of the largest cave passages in the world. He's currently a freelance guide with Borneo Adventure Tours & Travel, an eco- and community-minded local company. 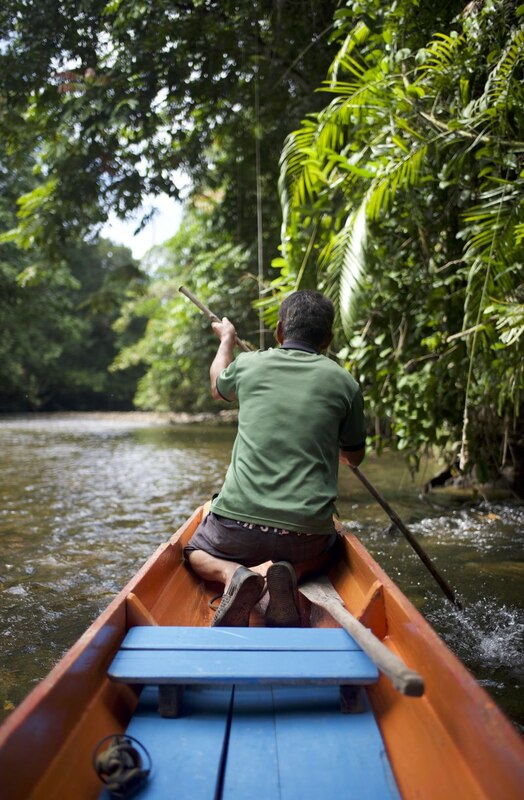 Noah, a freelance guide for Sarawak’s Borneo Adventures, paddles up the Sungai Melinau River on the way to the trailhead. 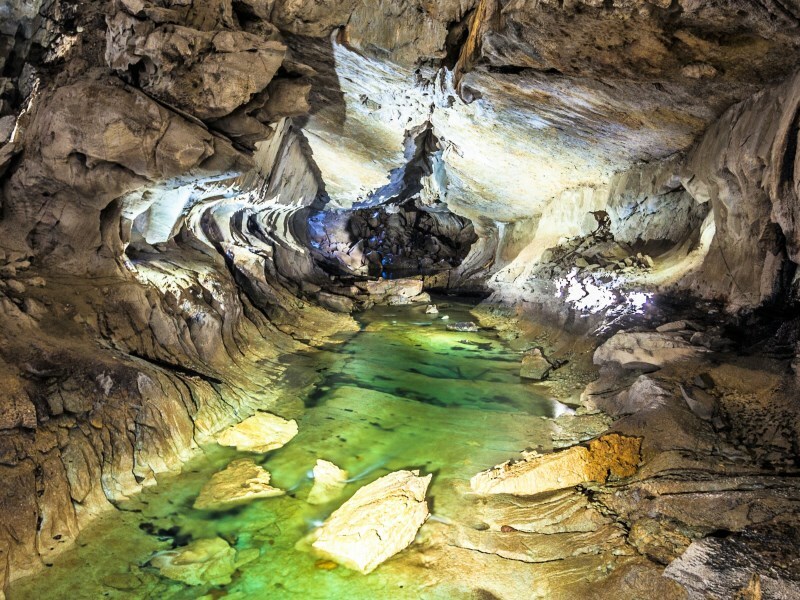 Clearwater Cave is Asia’s longest, at some 66mi (107km) in length. A 2.5mi (4km) nature trail weaves through its depths. There’s an Indiana-Jones feeling of mystery to our journey, as we scour the immense pit of Clearwater Cave with its subterranean river. 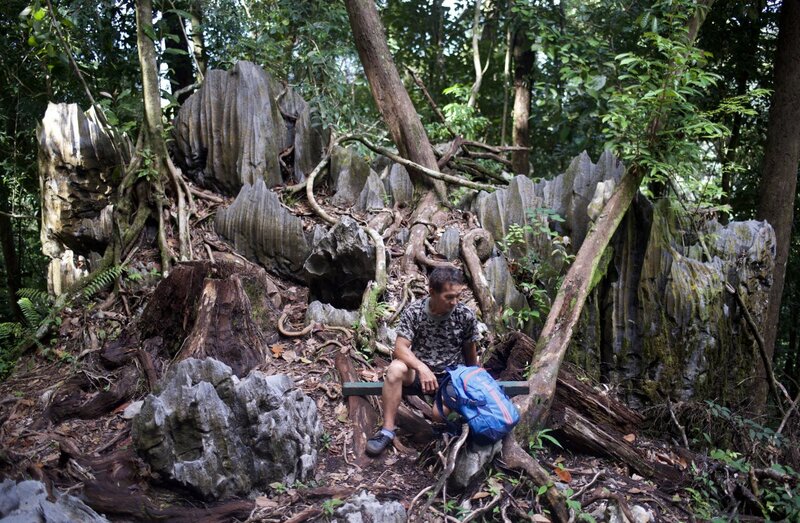 Our next stop is the start of a 5mi (8km) deep-jungle trek into Camp 5, along a trail with a bloodthirsty history. This was the route taken by Kayan headhunting parties who paddled upstream to launch raids on other tribes, then claim their heads as trophies. 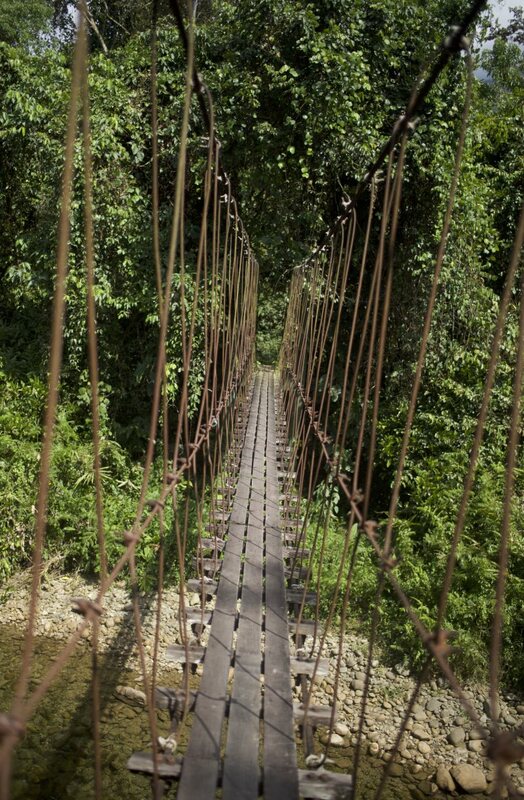 The rope bridges put a bit of the thrill back into the old headhunter’s trail. 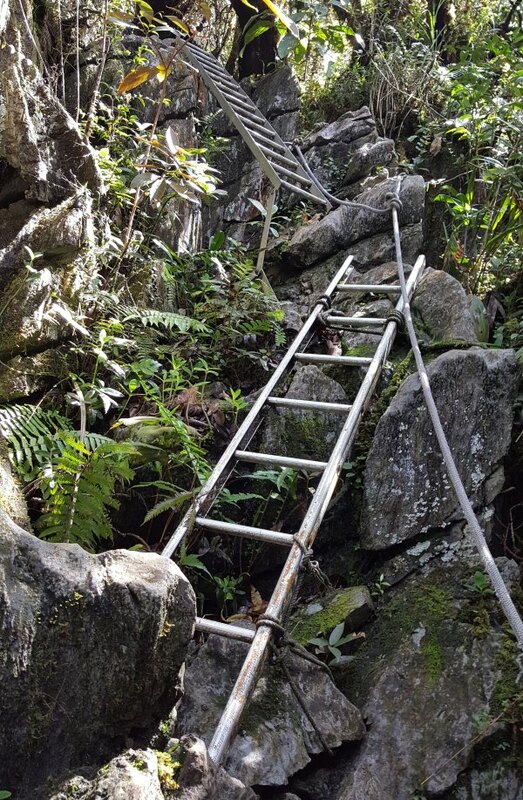 The nearly flat hike offers haunting forest sound-phonics and Tolkien-like scenery – the call of the woodpecker, platoons of buzzing insects, massive, gnarled buttress roots and tangled lianas, and the occasional leech to do battle with. 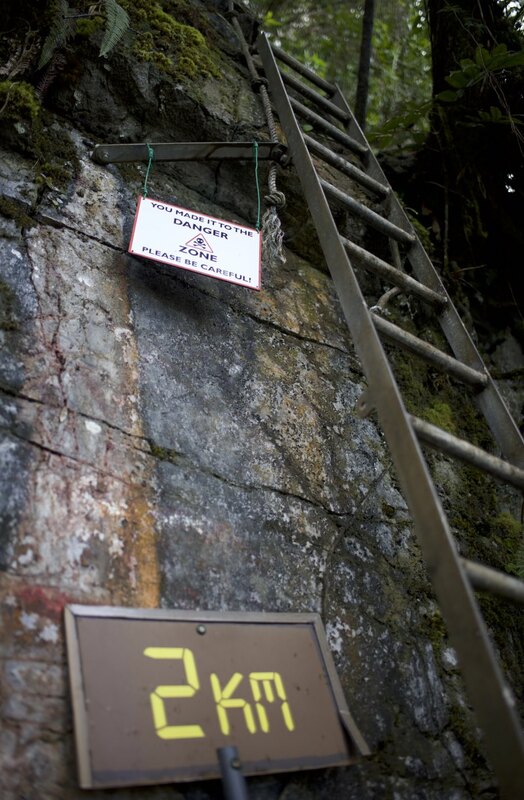 But ironically, the ominously named “Headhunter’s Trail” is the easiest part of the challenge. 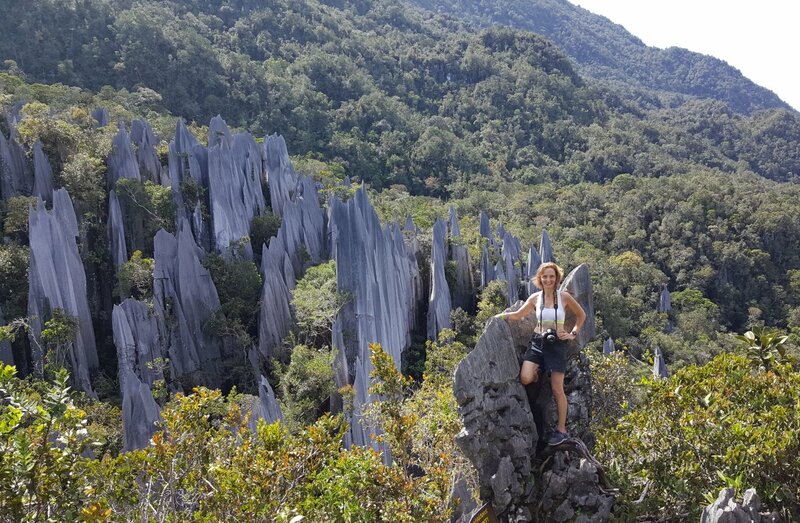 For many guides, including Noah, who has done the climb more than 1,000 times, the Pinnacles are the real test – a much tougher conquest than Sabah’s 13,435ft (4,095m) Mount Kinabalu, the highest mountain between the Himalayas and New Guinea, and the number-one Malaysian peak for most climbers. The Pinnacles are like a forest of limestone shards 147ft (45m) high. The warning bells ring loud during our post-dinner briefing with our guides. The trek rules are rigid and merciless, due to the treacherousness of the sheer 3,937ft (1,200m) ascent and perils of walking back after dark: We have to make it to the 2,952ft (900m) “Mini Pinnacles” within an hour, or else turn back; we must reach the top by 10:30am to be ensured of a safe return; if we don’t return to Camp 5 by 6pm, a search party will be sent out, and cost each climber USD$47/RM200 per half hour. At 2,952ft (900m) the rhododendron-and-pitcher-plant-festooned Mini Pinnacles represent the one-hour cutoff point for continuing on the trek. Our bare-bones accommodation for the night consists of a sleeping mat and mosquito net in open-air dorms. At 6am, I wake with a jolt, afraid that I’d managed to psych myself out of the walk and miss the departure. After fueling up on coffee and baked beans, we set off through swirling mist and light drizzle, spelling trouble ahead on the already perilously slippery limestone. 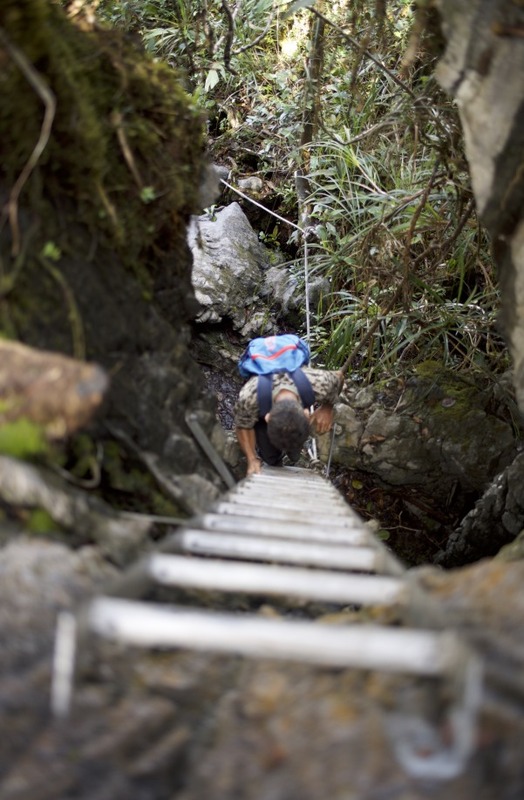 The going is immediately tough, as we negotiate steep, mossy climbs and rocky debris with the help of ropes. Each spike of razor-sharp limestone below looks set to pierce me, and I’m on high alert every step of the way. The last section of the trails is near vertical, and more of a rock climb than a hike. The sign says it all about the perils of the slippery vertical climb in the last half-mile. I haul my way up through a succession of 15 aluminum ladders, watched over with eagle eyes by Noah. At the summit, my views of the blinding white Pinnacles and the green valley below are more than a reward. But I still have a tricky descent ahead, which I tackle in soldier-crab style – on all fours – to save my knees, and nerves. After a seven-hour trek, I ease my aching body in the cool river waters, and feast on wild rambutan. The author, standing on top of the world at the Pinnacles Summit. Thankfully, the guides save their horror stories to the end of the walk – tales of fatal falls, climbers bleeding to death, and rescue parties returning at 11pm after climbing for hours in the dark. Though the dangers were real, my fears about the climb far exceeded the reality. I should never have considered giving up. Sure, it was a strenuous and at times scary challenge, but there were no 100-foot sheer drops to talk of, and it was totally within my climbing comfort zone. The lesson I learned is to ignore fear-mongering among amateurs. Go find out for yourself, and marvel at your accomplishments. Global-roaming journalist, travel writer, and photographer Tamara Thiessen migrates constantly between her Southern and Northern Hemisphere bases in Australia, France, and California, but considers her suitcase her most recognizable landmark. We all get a little nervous before traveling. Here’s how to overcome those pre-travel regrets, fears, and anxieties. No amount of gym classes could pepare Jennifer Neal for a climb up the world's highest natural pyramid. Enjoyed the trekking Boreno’s Headhunting Trail’ very much.